"I BELIEVE THAT PEOPLE HAVE A RIGHT TO DECIDE THEIR OWN DESTINIES; PEOPLE OWN THEMSELVES. 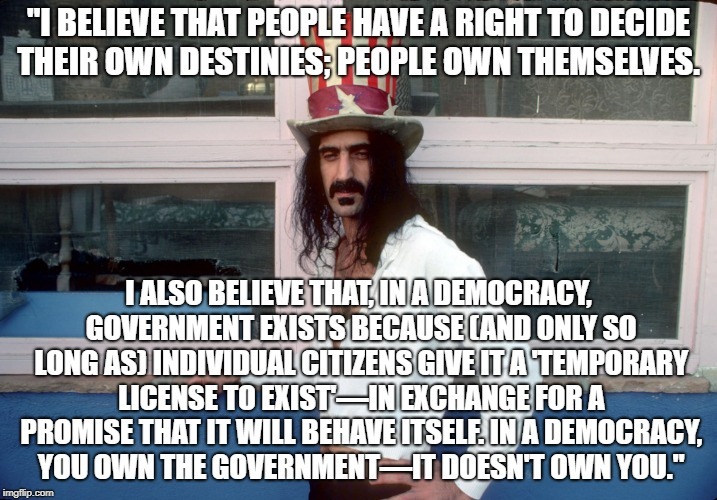 I ALSO BELIEVE THAT, IN A DEMOCRACY, GOVERNMENT EXISTS BECAUSE (AND ONLY SO LONG AS) INDIVIDUAL CITIZENS GIVE IT A 'TEMPORARY LICENSE TO EXIST'—IN EXCHANGE FOR A PROMISE THAT IT WILL BEHAVE ITSELF. IN A DEMOCRACY, YOU OWN THE GOVERNMENT—IT DOESN'T OWN YOU."